Actor Ranbir Kapoor will be the next brand ambassador of Coca-Cola, sources in the know told Business Standard. They said negotiations were on and an announcement is expected shortly. An e-mail sent to Coca-Cola India remained unanswered till the time of going to press. Kapoor’s celebrity management agency KWAN also declined comment when contacted. However, the sources said that Kapoor, who was the face of rival Pepsi earlier, is negotiating a multi-year contract with Coca-Cola. He has been charging Rs 6-8 crore for endorsements per brand per year after the success of Sanju in 2018. Consultancy firm Duff and Phelps had last week placed Kapoor sixteenth on its celebrity endorser list, with a brand value of $21 million (nearly Rs 150 crore at current exchange rate). Kapoor endorses Asian Paints and Flipkart among others. His movie Brahmastra, also featuring Alia Bhatt and Amitabh Bachchan, is slated for release this year. Shamshera from the Yash Raj Films’ stable is also in his kitty. 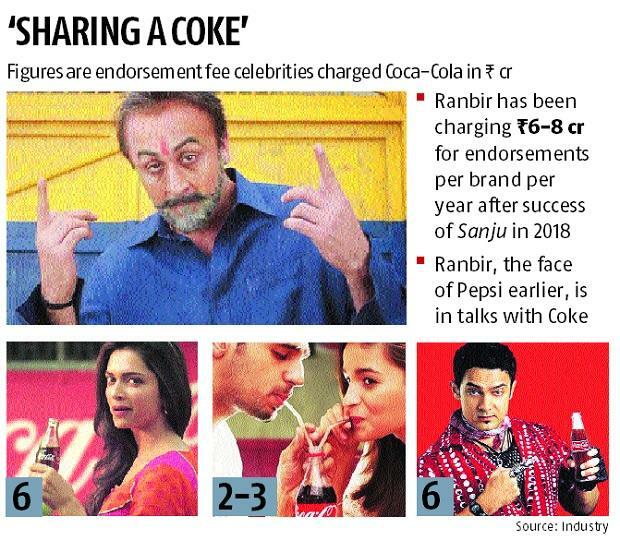 If the deal fructifies, Kapoor will join peers such as Bhatt, Siddharth Malhotra and Deepika Padukone, who’ve lent their name to Brand Coke. Coca-Cola India also has actor Ranveer Singh as the brand ambassador of Thums Up, following exit of Salman Khan in 2016. In 2002, Aamir Khan was ambassador for Coca-Cola and did the popular Thanda Matlab Coca-Cola campaign. In November, the company appointed actors Aditi Rao Hydari, Diana Penty and Rakul Preet Singh as brand ambassadors of Maaza. It also has names such as Mahesh Babu for Thums Up. PepsiCo, in the interim, has fewer star endorsers in its kitty, following cricketer Virat Kohli’s decision to move away from promoting carbonated sugary drinks. Kolhi had replaced M S Dhoni as Pepsi’s endorser in 2016 and declined to renew it in 2017. PepsiCo had subsequently teamed up with the star cast of Fukrey to launch an ad campaign. Among PepsiCo’s other endorsers are shuttler P V Sindhu, who is the face of Gatorade (sports drink), while actor Katrina Kaif lends her star power to Tropicana, Tropicana Essentials and Slice, and chef Vikas Khanna endorses Quaker Oats.